Giiven its early progress this year, Samsung looks set to smash that record once again in 2013. Strategy Analytics’s Q1 2013 data put Huawei behind Samsung in second place on 8.1 million units sold, having overtaken Lenovo — which has announced its intention to launch devices in the US within one year — which sold 7.9 million smartphones." Android tablet share growing, at 41.3% market share as of Q3 2012: According to the Strategy Analytics Tablet & Touchscreen Service, the worldwide tablet market grew by 43% annually as of Q3 2012, which is actually a slowdown in growth from the previous years. 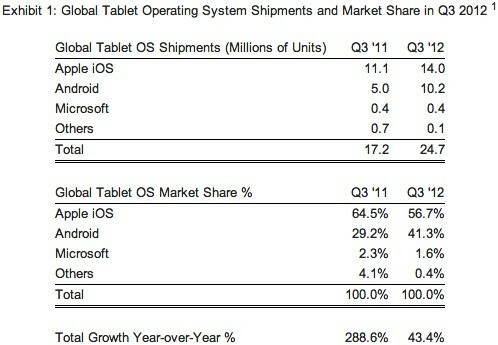 To illustrate, the global tablet market grew 289% year-on-year from Q2 2010 to Q2 2011, which may be considered a booming period, right after tablets became popular in the consumer market.